There is a reason fiber supplements are popular and sell so well: people understand how important it is to get enough fiber! In the last decade the medical community have done a great job emphasizing how beneficial it is to have a fiber rich diet, but Americans are still not consuming nearly as much as recommended. A large number of people resorted to supplements instead of foods likely because fiber rich foods sounded boring, hard to come by and or impossible to include in their diet. All of which are not true! Fiber comes in two forms: soluble and insoluble. Which gives you an idea on how they function, the body can’t absorb either, therefore the soluble fiber attracts water and forms a gel which slows down digestion and in turn helps you feel full aiding in controlling weight. It also helps lower cholesterol by interfering with its absorption and help control diabetes as well. The insoluble fiber are the gut friendly because it acts as a bulking agent preventing constipation. It passes through the GI tract relatively intact and speeds up the passage of food. You need to consume both, and it is not that difficult to find them, it is just a matter of making a few fiber rich foods a part of your daily routine. Fiber rich foods include whole grains, fruits, vegetables, beans, nuts and seeds. But here are my top 5 choices of fiber rich foods, because they taste great and are so easy to include in your diet. These are also very versatile, so you don’t have to eat them the same way every day and grow bored with your fiber rich diet. They are so easy to add to soups or just serve it with a side of brown rice. I like to also puree pinto beans and add a bulking ingredient to meat loafs, creamy soups, and even in baked goods! 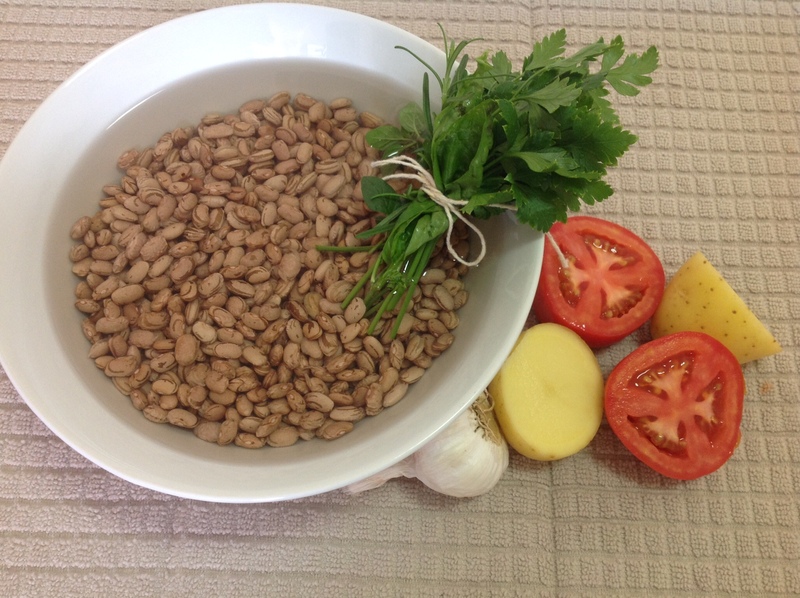 Try to eat them daily and when you get tired of pinto beans, try navy, kidney or lentils! Use canned or cook your own in big batches and freeze. They make great snacks and fancy appetizers if you take the time to stuff them with fancy ingredients! But I use them in many different ways. I have the dried ones chopped in small pieces so I can easily add to cereals and yogurts in the morning. I also keep a small jar with puree dates (make it yourself by just placing them in warm water and use the food processor) to add to baked goods, homemade granola bars, and use it instead of jelly! Puree peas is one of the first vegetables we introduce to babies, toddlers enjoy working on their fine motor skills by eating them whole and we should never forget our love for peas! They can be perfect as a side dish by itself, or added to soups and stews. They go very well as a salad topping and if you toast them they can be a crunchy snack too. My favorite excuse to eat peanut butter and fruit spread (remember that date paste I talked about! Or just mash up a banana) is that I am working on meeting my daily fiber requirements! They are so easy to add to baking goods, sauces and good enough to eat with a spoon! Recycle your empty Parmesan cheese container and fill up with wheat bran. Then, when you are cooking soups, stews, stir fry, or just about anything, sprinkle some wheat bran. It is a powerful source of fiber but people are often intimated by how to use it and the fact that it doesn’t taste very good all on its own (don’t try to eat a bowl full at once either!). But if you just sprinkle it on top of your yogurt, cereals or smoothies, at the end of the day you probably added up to at least a few tablespoons! Hopefully this inspired you to try some fiber rich foods and build your own top 5 favorites! It will be cheaper than buying a supplement and as you can see by the ideas I shared above it really isn’t that difficult to eat fiber rich foods. You probably already eat some, so just adding a couple more will get you to that recommended range (men: 38 grams/day men over 50: 30 grams/day; women 25 grams/day, women over 50: 21 grams/day). And always remember to drink plenty of fluids when consuming a fiber rich diet. Without liquids, a high fiber diet can have the “cork” effect, … sorry about the visual but when you have an abundance of bulking agents for your stool and no liquids to help it move through; well, you get the picture. Hummus: Make it at home! Mmmmm. 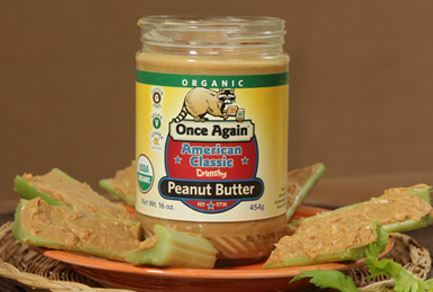 Love Peanut Butter….especially Once Again Nut Butters. Good source of many things. Thanks for sharing these fiber rich foods.I love beans and good eat them everydayI didn’t know that peas were a fiber rich food. This is a good reminder to include all these foods in my diet. Thanks. Nuts and nut butters are my favorite way of getting fiber. Definitely had a big bowl of fiber rich foods for dinner last night. It was homemade bean soup night. 15 different types of beans and yes I even put in lentil (which I hate). Yet, actually I hardly tasted the lentils last night as lots of garlic in the broth seemed to cover over their taste, this time. Homemade rolls on the side. Hubby couldn’t even finish his and will be eating his left overs for a snack sometime today I’m sure. Try to eat beans often. We eat a lot of peanut butter in this household as well. Instead of commenting as littlefamilyhome via wordpress, probably better to comment as Lauralee Hensley, but not sure how to do that change right now. Thanks. Great on explaining the cork effect! Lol as I have had this happen and really working on getting more water daily! These are my favorites too, especially beans. I like using the dried beans cooked in the pressure cooker along with home made corn bread in the oven. OANB Sunflower Nut for me every AM. So good! I never thought of dates, peas and nuts as having fiber. I’m a bean fan, and a dollop of peanut butter in my beans make them creamy… Red beans and rice is one of my favorites! Love the old fashioned crunchy peanutbutter!